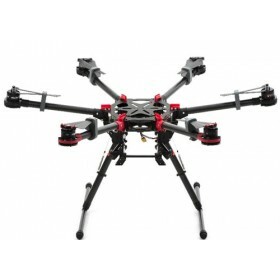 The DJI Wookong M is a complete flight system for all multi-rotor platforms (QuadCopters, HexaCopter like the DJI Spreading Wings S900 or OctoCopters like the DJI S1000 Octocopter Premiumfor commercial photography and industrial applications. Unlike many other multi rotor flight controllers, the DJI Wookong M allows the use of regular ESC commonly found on RC multi-rotors without any wiring modification; the "Heli" type mode set-up provides a seamless transition for current users of the Ace One professional system, and if you are new to the DJI Wookong M you will find setting up the system very easy with the very user friendly UI and easy to follow instructions. 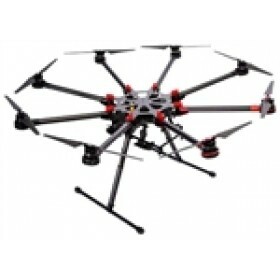 The DJI Wookong M multi-rotor utilizes the highest quality components, which are precisely calibrated with temperature compensation on all of the gyros and sensors. 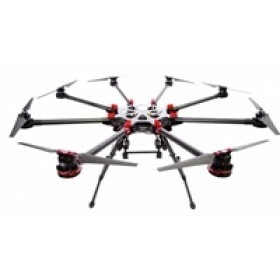 The Wookong M has industry leading flight algorithms for an autopilot and UAV use. 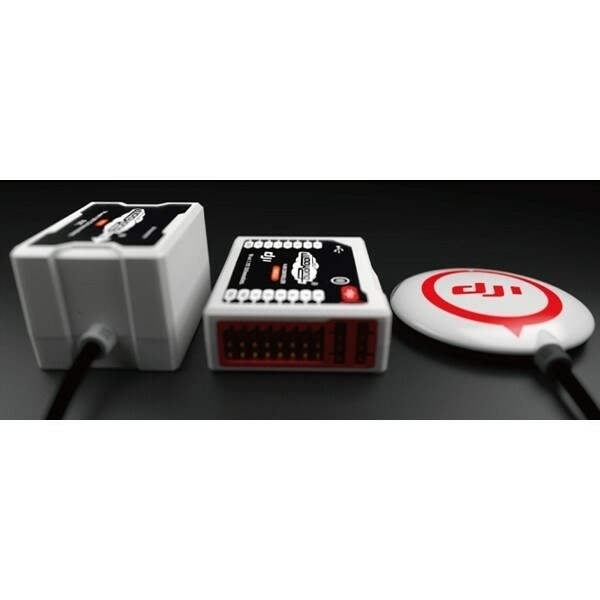 The IMU has a damping system, which is rated for gas engines and is by far the best in its class. The WKM is compatible with most radios supporting either PCM or 2.4Ghz, we recommend using the S Bus system from Futaba, it allows for the most amount of features to be used on this flight controller. Attitude mode maintains precise altitude hold for indoor flight while GPS mode provides superb position hold outdoor. The external LED is very bright and is also a flight mode indicator light, pilots under any condition can easily observe this LED. The latest addition to the functions offered in the firmware updates include the "care free" mode and an increase in performance for heavy lifters along with elevated permission for current WKM owners to enable additional M veiw features. This latest firmware updates takes away the need to know the orientation of your multi-rotor craft after you have flown over 10 meters from the home position. Please see the in flight test videos above that we have done using this flight controller and Autopilot with the care free mode. There is also the POI (Point Of Intrest) function, which is very useful when you need to keep the focus on one point, the point of interest can be used up to 500 meters away from the recorded POI. The addition of the Wookong M Bluetooth LED allows users from firmware 5.22 to use an iPhone / iPad to make changes to the Wookong M flight parameters without needing to take a laptop to the field. 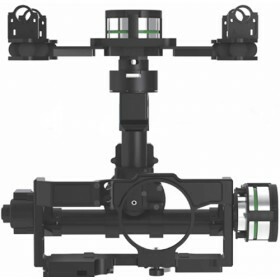 The gimbal stabilization built in to the Wookong M is compatible with almost every 2-axis gimbal system. The system will adjust the camera gimbal according to the attitude of the helicopter after setting the parameters the first time. The best gimbal to use with the Wookong M is the Zenmuse, this is a full 360 degree rotation in each of the 3 axis, the Zenmuse is connected to the Wookong Flight Controller via the Can network and offers the best in camera control and stability all in one package from DJI. 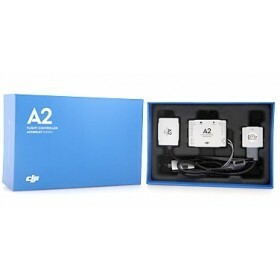 The DJI Wookong M can be flown in one single full auto (GPS-Atti) mode from take-off to landing; or in Atti mode while manual mode has stabilization activated. 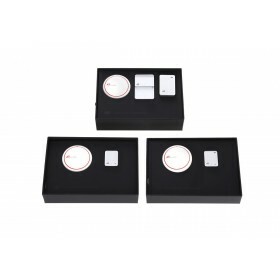 The system is very easy to install with user-friendly software allowing on-line firmware and software upgrades as they become available. Adding the additional upgrade of the DJI iPad Ground Station + 2.4 GHz Bluetooth Data Link allows the DJI Wookong M to send real time flight data to theGround Control Station, the GCS has moving maps and other useful information on the flight of your multi rotor copter, for more detailed information on the M View system please see the product iPad ground station page. As DJI continues to refine the Wookong M controller with improved flight performance and features there will be a flight algorithm refinement, this will be dealing with tail and head wind condition to maintain a smoother flight for all Auto Pilot work; this will see an improvement in the flight stability over and above the current flight performance. The long awaited PPM is now available for Wookong, providing Octo and X8 users using non-S-bus system access to remote gain adjustment, less cabling for a neat layout when the PPM receiver is prefer over S-Bus. The Gimbal servo output increased from 100 Hz to 400 Hz for non Zenmuse users, and the servo endpoint to 90° for better gimbal performance. The POI circling flight from 5 to 500 meters diameter enhances the Auto Pilot performance and options. There is the additional channel to activate the RTH via transmitter switch makes recovery a flip of a switch away from the firmware 5.12a onwards. 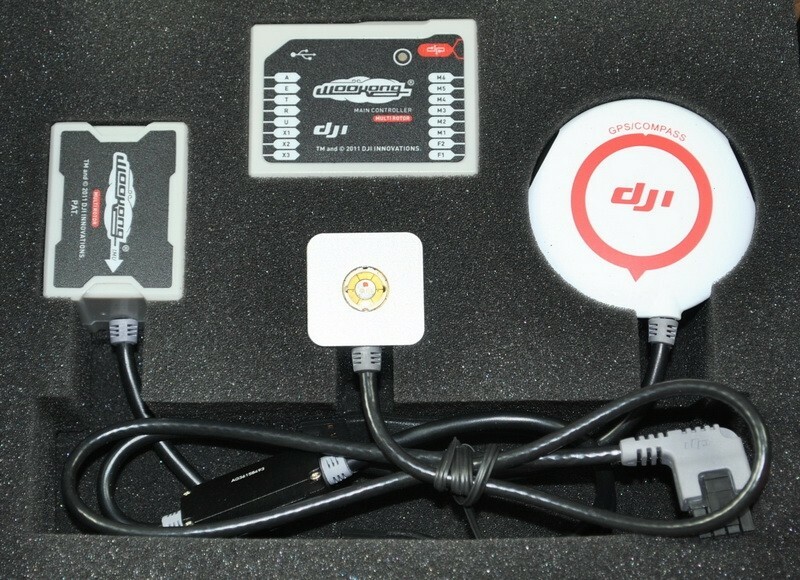 The latest firmware for the DJI Wookong now supports the use of a Bluetooth "LED" which will allow communication with an iPad, the Wookong M Bluetooth LED can be used for in flight tuning and adjustments of the flight parameters. Multi attitude control; Stick center position for 0º attitude, its endpoint is 35º. Maximum angular velocity is 150°/s. No attitude angle limitation and vertical velocity locking. Lock rotor position when GPS signal is adequate. After 10s when GPS signal lost, system enters Atti. Mode automatically. Only performing attitude stabilizing without position lock. Notice: Flight Performance can be affected by mechanical performance and payloads. Nice people - fast answers on my VAT question - and very fast shipment - kind answer to my question about wookong upgrade. 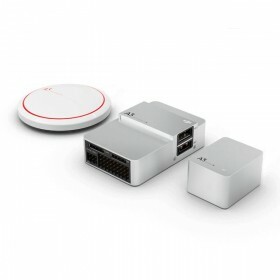 I found Martin very polite and extremely helpful, and the build quality is excellent..will use him again. 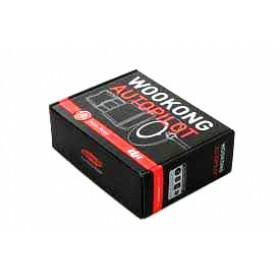 10 out of 10points wookong m is one of the bests controllers on the market. Awesome seller. Great and fast delivery to Lithuania.